One of the things that intrigued me about this recipe is its author, Sanford D’Amato. D’Amato is a well‐known and respected chef here in Milwaukee. His restaurant, Sanford, is by all accounts the best place to eat in the city. I haven’t had the pleasure of eating there myself (I was too cheap in my childless days and now too busy in my child‐filled days), but I’ve dined quite often at his more casual Coquette Cafe. His recipe doesn’t disappoint. Not only does the dish taste fantastic and look impressive, but you can do much of it ahead of time. I brined my chops and creamed my leeks last night, then cooked the rest of the dish (along with some mashed potatoes) when I returned home from work. Total dinner cooking time was about 35 minutes. After a long day at work, a dinner made in less than an hour tastes far better than one you’ve had to slave over. And far, far better than takeout Chinese. Bring 4 cups of the cider, salt, allspice, and bay leaf to boil in a large saucepan, stirring to dissolve the salt. Cool completely. Place the pork in a 13 x 9 x 2‐inch or similar‐sized glass baking dish. Pour the brine over. Cover and refrigerate overnight. Melt the remaining 2 tablespoons of butter in a large nonstick skillet over a medium heat. Add the apples and saute for 5 minutes. Add the sugar and saute until the apples are golden, about 6 minutes longer. Add the stock, then the remaining 1/2 cup juice or cider. Simmer until the liquid thickens slightly and the apples are tender, stirring occasionally, about 5 minutes. Set aside. Prepare the barbecue (medium heat) or preheat the broiler. Drain the pork and rinse under cold water, then pat dry. Brush the pork with oil. Grill or broil to desired doneness, about 5 minutes per side for medium. Meanwhile, rewarm the leeks, thinning with 1 to 3 tablespoons half and half or cream if necessary. Bring the apples to a simmer. Spoon the leeks onto plates. 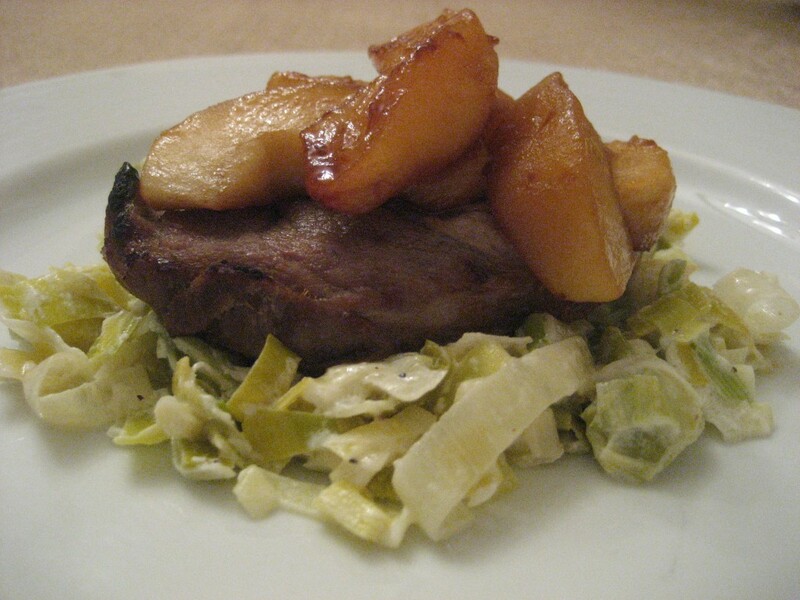 Top with the pork, then apples. Serve with mashed potatoes or good crusty bread.